This tea infuser mug solves the main issue with nearly every other tea mug; the ability to brew tea and stop the infusion process without having to remove the tea from the mug. Designed with an ultra fine stainless steel mesh filter and patented infusion-stopping chamber, the Tea Tumbler tea infuser mug allows you to brew a perfectly clean cup without the worry of over-steeping. Once the plunger of the tea infuser mug is pressed, the tea leaves are compressed into a solid chamber and away from the water. The double-walled, vacuum-insulated, restaurant-grade stainless steel construction of the Tea Tumbler gives it phenomenal insulation properties and incredible durability making it a very versatile and low maintenance travel companion. The lid snaps shut for a drip-free closure and has an oh-so comfortable drinking spout. Plastic lid and plunger rim are BPA-free. 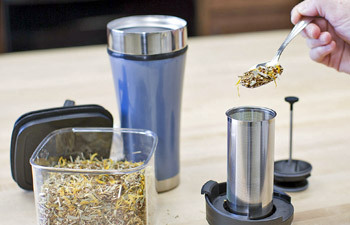 To use, simply place a desired amount of loose leaf tea in the Tea Tumbler infuser mug chamber and place the chamber into the infuser mug body. Pour hot water over the leaves. Place the tea infuser mug lid on top and twist into the locked position. Let the tea steep for 2-5 minutes (depending on desired taste and type of tea) and depress the plunger. See below for a step-by-step how to video. Available in 2 colors: Brushed Steel with the Arbor Teas Logo and Starry Night Blue.